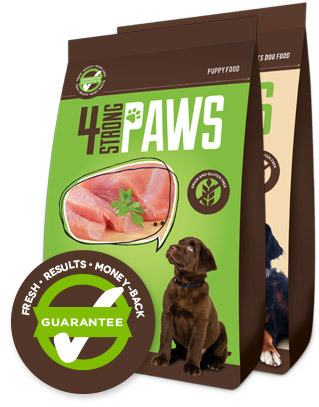 4 Strong Paws Dog Food provides balanced nutrition to ensure the extra nutritional demands of your dog are met. 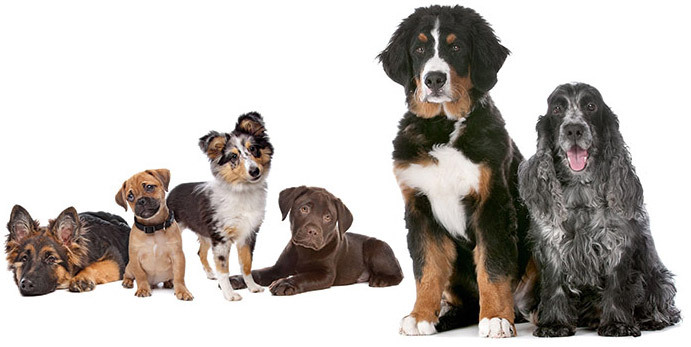 We use highly digestible meat and fish proteins, the inclusion of prebiotics, probiotics, botanicals and other healthy nutritional supplements to support your dog’s developing digestive and immune system for optimal health. Main Ingredients: Chicken Meal, Lentils, Oat Groats, Chicken Fat (preserved with mixed tocopherols), Salmon Meal, Brewer’s Yeast, Whole Dried Eggs, Ground Flaxseed, Alfalfa Meal, Green Peas, Coconut Oil, Sodium Chloride, Salmon Oil, Potato, Sweet Potato, Potassium Chloride, Mannan Oligosaccharides (MOS), Dried Kelp, Chicory Root Extract, Yucca Schidigera Extract, Choline Chloride, Rosemary Extract, Apples, Carrots, Cranberries, Blueberries, Tomatoes, Pumpkin, Probiotic (Lactobacillus Acidophilus), Chondroitin Sulphate, Glucosamine, Iron Sulphate, Zinc Oxide, Vitamin E Supplement, Copper Sulfate, Folic Acid Supplement, Vitamin B12 Supplement, Vitamin A Supplement, Niacin, Selenium, Manganese Oxide, Calcium Pantothenate, Riboflavin, Biotin, Vitamin D Supplement, Calcium Iodate; Botanicals: Oregano, Cinnamon, Red Pepper Extract; Chelated Minerals: Zinc Amino Acid Complex, Manganese Amino Acid Complex, Copper Amino Acid Complex, Cobalt Glucoheptonate. Main Ingredients: Chicken Meal, Whole Green Peas, Lentils, Chicken Fat (preserved with mixed tocopherols), Brewer’s Yeast, Alfalfa, Whole Dried Egg, Tapioca, Natural Chicken Flavour, Chicken Liver, Coconut Oil, Sweet Potato, Sodium Chloride, Salmon Meal, Salmon Oil, Potassium Chloride, Mannan Oligosaccharides (MOS), Calcium Propionate, Kelp Meal, Chicory Root Extract, Yucca Schidigera Extract, Choline Chloride, Rosemary Extract, Apples, Carrots, Cranberries, Blueberries, Tomato (Natural Source of Vitamin K); Probiotics: (Dried Bacillus Licheniformis/Bacillus Subtilis Fermentation Product), Pumpkin, Chondroitin Sulfate, Glucosamine, Iron Sulphate, Zinc Oxide, Vitamin E Supplement, Copper Sulphate, Folic Acid Supplement, Vitamin B12 Supplement, Vitamin A Supplement, Niacin, Selenium, Manganese Oxide, Calcium Pantothenate, Riboflavin, Biotin, Vitamin D Supplement, Calcium Iodate; Botanicals: (Oregano, Cinnamon, and Red Pepper Extract); Chelated Minerals: (Zinc Amino Acid Complex, Manganese Amino Acid Complex, Copper Amino Acid Complex, and Cobalt Glucoheptonate).